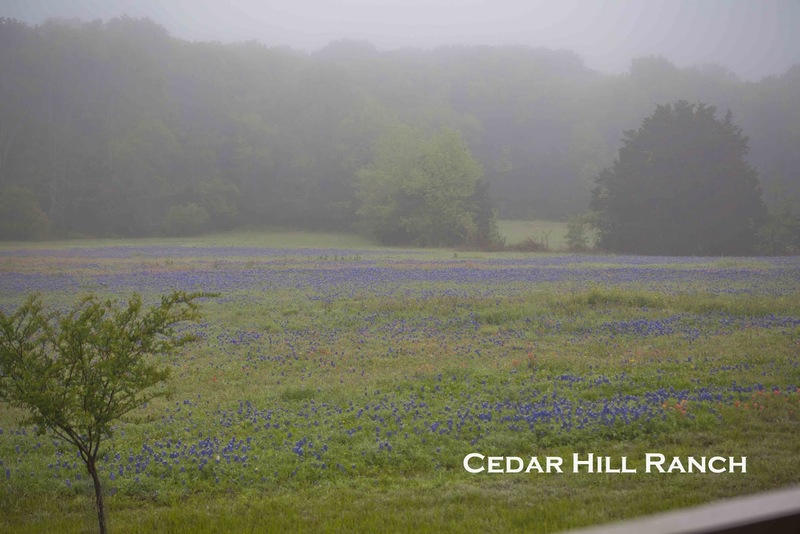 Hi, it’s Anita here from Cedar Hill Ranch. This post is part of our Christmas in July series. We have 8 days of Christmas projects to break up this July heat, and the posts are showing on 8 fabulous blogs. I’ll show you the schedule later in this post. 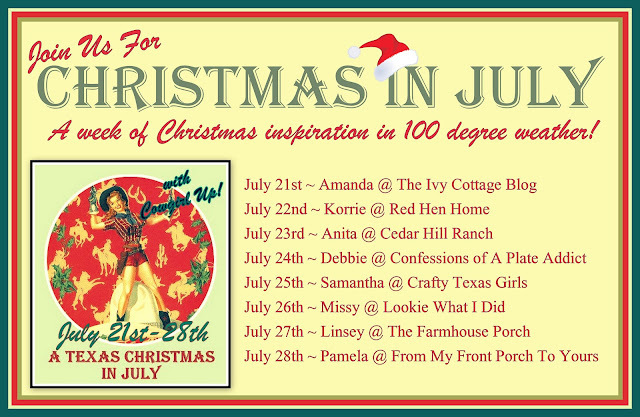 When the Cowgirl Up ladies were discussing doing a Christmas in July, I have to admit I panicked a little. I had no idea what I was going to do, because I don’t think of myself as being crafty. Everyone chimed in about what a great idea it was, so that was that. I could go along with the group or be the “Debbie Downer.” Now I had to come up with something, or be the mean mom that tells the cool kids they are being too loud. This spring when the bluebonnets were in full bloom, this was my view when I had my morning cup of tea. I love it when the bluebonnets are blooming. It’s a magical few weeks. 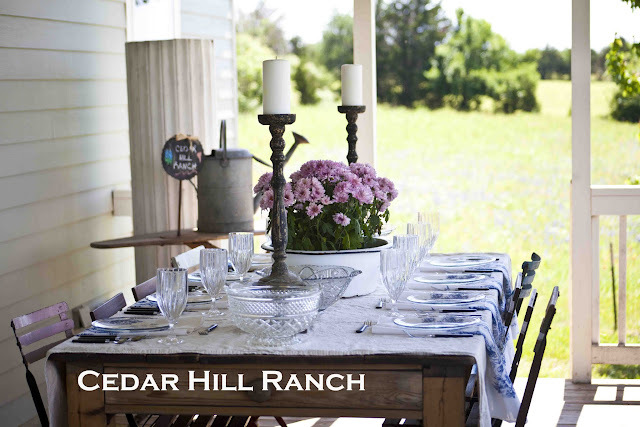 Cedar Hill Ranch is a 30 acre ranch in the heart of Texas. It’s what I call “Texas Living with a French accent.” Dinner on my back porch with my friends and family is really a picture of what life is here is all about. Here’s the schedule for the entire Christmas in July Series. You can see all of the posts by visiting the blog you are looking at right now, but I would love it if checked out all of these wonderful blogs. I had some ideas of what I could do for this project, but they required my sewing machine that was in the shop. Since then I have received news that it will cost $200 to repair it, so I’m shopping for a new one. So what to do… I pulled everything (and I do mean everything) craft-related out of every drawer in the house, and laid it all out. After surveying my materials, I came up with the idea of making Christmas cones that could double as place cards. I think solid green paper might have worked better, but I didn’t have solid green, so I used what I had. I added a twine bow to the top of the cone. I also used these card stock tags from Pick your Plum for the placecards, using just the first initial of each guest’s name. I also cut a little piece of snowflake trim to top off my cone. Later, these cones can be hung on the tree using the twine bow at the top. I filled the cones with tiny, little pinecones. Okay, pinecones don’t come this small, they are actually from Hemlocks in North Carolina. I grab these from the ground each year when we go there. I also used vintage sheet music from my FIL’s collection to go under the saucers. These are church hymns, and the date of publication was 1926. Here’s a view of the table with my new Christmas cones. She kept these stored away for that special occasion that never came. I’m sure she did use them at least once when she was yonger, but in the 30 years that I knew her, they stayed snugly stored in one of her china cabinets. This turned out to be fun! Thanks for joining our Christmas in July party. Remember to come back Tuesday morning for Cowgirl Up. Next week Cowgirl Up will resume it’s normal schedule of going live Monday night at 9 pm. What a great post and tutorial. Hi Anita! Now you’re branded as a crafty gal! This is gorgeous and so creative. I’ll be back tomorrow to link up for Christmas in July! how beautiful! I love your script cones with the snowflakes!! Your home and property are just gorgeous!! Anita, I’m so glad you went along with the group on this one. I love this project! This is actually one I will make. I already have the script stamp. 😉 These cones will be perfect for a little party favor and would be great for any holiday. Your table setting is gorgeous. I bet your MIL is smiling down on this table, perhaps wishing she had used those “special” dishes more often. The exquisite linens offer a lovely background to the creamy white and gold of the china. I’ll be back tomorrow morning to link up some Christmas tablescapes. See you then, cowgirl! Oh, dear, dear friend…I could never in my wildest dreams think of you as a “Texas Scrooge”! Your crafting French Scones are maginificent! 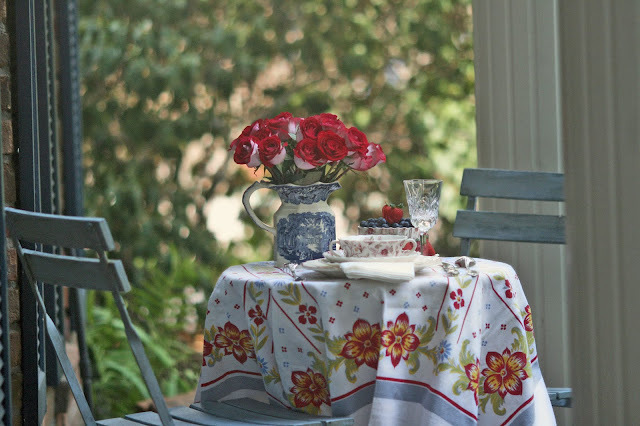 Thank you for sharing your lovely heirloom linens, china and collectables with all of us! Have a blessed week! Great project! I am also having a Christmas in July celebration over at my Christmas Blog, A Debbie-Dabble Christmas. If you would like me to link up this post to the celebration, I would be thrilled to. Amanda has her post linked up. Just give my Celebration of Christmas in July a shout out is all I ask..
Hi Anita, I just hopped over from Confessions of a Plate Addict. So happy to have found you. I love your cute cones. I especially love your back and front porch. Your view of the Bluebonnets is breathtaking. Thanks so much for sharing a bit of Texas. I am now a new follower. I plan on linking up a vintage Santa I just bought tomorrow with the party. Oh I forgot to tell you that I recently purchased a set of those wheat dishes at a thrift store for $30. A few missing, but still a nice set. Can’t wait to use them. Ah ha ha ha ha ha…. Texas Scrooge. I love how you came up with the idea using the chicken wire as a stand. The cones bring a real homey feel. Thanks for the great tutorial! I just love your photos of the ranch! You make me laugh at the Cowgirl Grinch! I would have panicked at Christmas in July too! Your cones are lovely! This is such a cute favor to take home for the tree! Thanks for the tutorial! great creative thinking on the chicken wire! Yep, I agree with the others and am glad you went for the party! These cones are great! I could so relate about being the mean mom who tells the cool kids they are being too loud. Sad but that resonates with me a little too much as I get older. Ha! Well, turns out, you have latent crafty tendencies. Looks like the cool kids have their work cut out for them keeping up with the woman of the ranch. (which by the way is breathtaking. How wonderful to live in such a setting!) Thanks for your fun comment at Quirky Vistas about my garage sale logic! I appreciate you taking the time to stop over. It was such fun, wasn’t it?